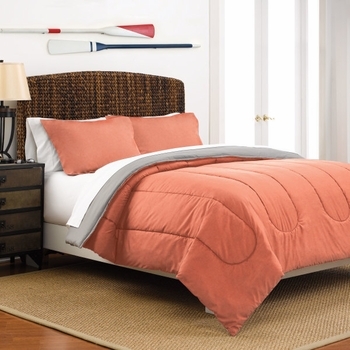 Reversible comforter set by Martex includes 100% polyester comforter and matching pillow sham/s. 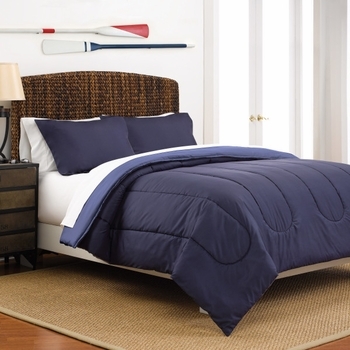 1 Standard Pillow Sham in Twin Size 20" x 26"
2 Standard Pillow Shams in Full/Queen Size 20" x 26"
2 King Pillow Shams In King Size 20" x 36"
Twin Comforter 66" x 94"
Full/Queen Comforter 88" x 92"
King Comforter 106" x 92"
Crafted of polyester and available in twin, full/queen, and king sizes, the Martex Reversible Comforter is stylish and can go from the dorm room to the guest room with ease. 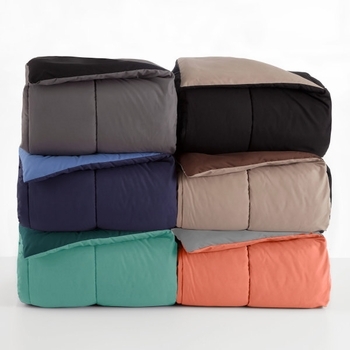 Choose from khaki/chocolate, navy/ceil blue, ebony/khaki, coral/light grey, turquoise/teal and graphite/ebony � no matter what colors you select, this comforter and coordinating shams (twin set comes with one sham, Full/Queen come with two standard shams and king comes with 2 king shams) makes for a striking and easy-to-switch-up look that�s perfect for any bedroom.